As we look back on the first 3 years in Taiwan, we are filled with gratitude to the Lord who has faithfully provided for our needs, protected us from lasting discouragement, loneliness & spiritual afflictions, and graciously allowed us to serve in Taiwan. One great blessing that helped us much in terms of ministry is the fact that God helped us form invaluable relationships here. In Taiwanese culture, family ties are very strong. Filial piety (a virtue in Confucian philosophy to respect your parents and ancestors) is greatly honored and in most families expected. Relationship is very important, i.e. friend, co-worker, teacher – student, etc. Relationships can help make your life a bit easier too because help is more readily available when you need it and recommendations can go quite far. Who you know can be very helpful in times of need. Let me give you an example. We bought a used car and now it’s 10 years old. I’ve had to take it in for maintenance or repair many times, especially this year. Foreigners are often overcharged for services like this because there is no menu of prices, especially in small shops, we don’t know how much things are supposed to cost, we don’t understand all that the mechanic is saying as they explain the problem and what needs to be done about it, and we’re not used to bargaining. I leave feeling bad knowing I’m being overcharged but glad that the problem is resolved or unaware that I was overcharged until the next time I go in and he bids a different price from the last time for the same thing. So last time when our car’s air conditioner was broken, I decided I would ask a Taiwanese friend to recommend a mechanic. He not only recommended someone, he went with me. This was such a blessing because when the mechanic saw Mr. Li, he gave me a big discount. Neither of us had to even ask. 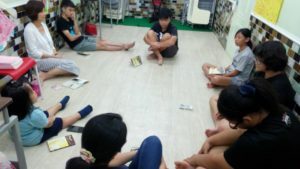 Understanding about relational culture of Taiwan, missionaries spend a lot of their time (sometimes years) to establish & build relationships based on trust. Then when we feel it’s appropriate to talk about it, we share the gospel. Without a trust relationship, we found that people may be cordial & respectful, but they are not wanting to stop and listen to us. We can have light-hearted conversation about the weather or what we had for dinner, but we can’t get into deeper topics. 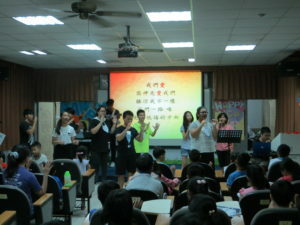 Therefore, we are thankful we are able to partner with Taiwanese Christians and church. Through them we are able to do ministry that otherwise would take years to establish. Because they already have good relationship & standing in the community, it also gives us credibility as missionaries. In a country where the percentage of Christians is so low, we are truly grateful to the Lord that we got to meet special Christians who are running this race together with us. What a blessing to have those trust relationships. Great to meet another OMF family! May the Lord bless your work in Japan abundantly!